All the words I use in my [blog posts] can be found in the dictionary—it’s just a matter of arranging them into the right sentences. 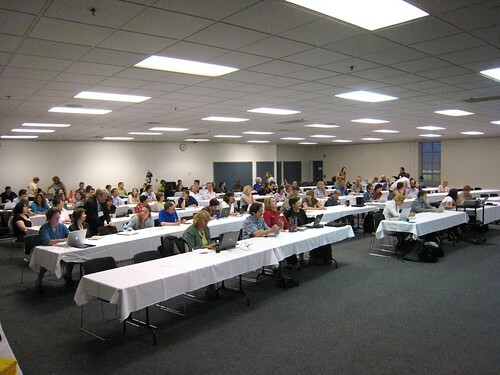 Wow, what a turnout today for my session at the University of Delaware on 50 Web 2.0 Ways to Tell a Story – they expected 100 and it looked like more. Since the media crew here was recording me and the screen t make a pod/vodcast, I did not bother with ustream-ing, so there should be a nice quality recording soon. With assistance from @mathplourde, the group participating in the Summer Faculty Institute were doing live commenting via CoverItLive. I also did a really compressed version after break of the 2008 Horizon Report Presentation Rachel Smith and I did last week in St Paul, using the lovely Vuvox Collage (yes, I hope the closed beta opens soon!). Okay, this whole trip has been extra special since I was an undergraduate student at UD in the 1980s. I entered as a computer science major, and had a flash of memory walking past Smith Hall where I did programming on a lineprinter in 1981. I lasted a year in this major and while I liked solving problems via code, I found the problems we had as assignments to be so arcane and obscure, and then had some panic at the thought of having a career in cubicle far from sunlight. I ended up switching to Geology my second year, grinded out 2 more classes t get a minor in computer science, and later in graduate school in Arizona came full circle to using computers– but now finally for a reason. So I am taking in the sights here from 20 years ago, remembering some, and forgetting a lot, seeing familiar places, and other places I should remember but dont. By request, tomorrow night we are going for happy hour at the Deer Park Tavern, though I have been repeatedly warned it is not the same dive bar it was I liked in the 1980s. The Post House has not changed, and I hear that living on Skid Row is still popular (including a massive music festival). But Main Street now sports chains, the dreaded coffee menace from far away, and the Stone Balloon is long gone, now a site of new condos. I got some ribbing over tonights dinner and beers at Klondike Kate’s because I could not remember all the places I lived while here. Memry is awfully fickle. There are a lot of new buildings on campus, plunked in what were empty spaces, but its still got a lot of open spaces. It was a great day, and I am super impressed with the activities and energy of the Summer Faculty Institute— 60 faculty applied for 30 spots, and each one earns a new laptop they get to use and keep starting at the beginning of the week. The days have many hands on session, great discussions, and the energy level is rather high all around. I’ve meet a long list of dedicated faculty trying blogging, Second Life, Sakai, podcasting, video editing, and more. So thanks to UD for this opportunity to do my dog story show here and to stroll down memory lane, even if the lane is a bit fuzzy on some details.